Provide comfort for the family of Stephen Burke with a meaningful gesture of sympathy. Outlaw, humanist, revolutionary, servant, friend: these are the terms we choose to define our beloved Steve Burke, whose energy and compassion now burn in the hearts of all who knew him. Born in Indianapolis during WWII, Steve was the first-born child of Francis E. and Elizabeth Johnston Burke. Steve grew up in Grandview Heights, Ohio, along with his younger siblings, Jeff and Betsy. Even as a child, it was clear that he was born a rebel. He chose to roam the woods and streams rather than endure the boredom of a classroom. As a teenager, he found lives he could relate to in the writings of J.D. Salinger, Jack Kerouac, Alan Ginsberg, Emily Dickenson, and William Faulkner. Steve never finished high school. Yet, his library and his innate ability to store and interpret knowledge rival that of any Washington think-tank. Rooted in experiences forged as a wandering young man spending time in Mexican jails, the rowdy clubs in the French Quarter, the streets of Provincetown, the honky-tonks of Columbus’ South Side, Steve found it hard to find a place for himself in the dominant choices offered in America. His life increasingly became fueled by alcohol. In a last attempt to find a place in “normal’ America, he enlisted in the US Army. He never made it out of bootcamp: he was charged with assault on his drill sergeant, thrown in the brig, and dishonorably discharged. In the summer of 1961 Steve met June Winchenbaugh in Provincetown, Mass. They were married the following year. 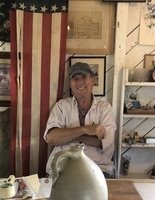 The family moved to Truro on Cape Cod where Steve worked as a stone spotter for the contractor who built the Provincetown Breakwater, a fence builder, a handyman for the bars and clubs in Provincetown where he became a familiar barstool fixture at the Foc’sal. There were automobile accidents. There were nasty confrontations. There were lost nights and miserable mornings. In 1978 Steve found his way to sobriety and his life changed dramatically. In the 1970’s Steve, June, and their two daughters, Lisa and Evie, moved to Maine. With Steve’s background in silk screening and June’s artistic talents, they founded Sirius Graphics. Within a few years the business expanded from the barn to include retail outlets in Wiscasset, Camden, and Boothbay. The family flourished. In 1996 June passed prematurely of lung cancer at the age of fifty-three, leaving Steve widowed. After her passing Steve came to find a new purpose in life, in service and kindness and a helping hand. He was profoundly disturbed by the US blockade of Cuba, so he worked tirelessly to help deliver humanitarian aide to the Cuban people. Steve always stood up for what he believed was right both for his community and the environment. He organized to save the Elephant Tree and other old growth trees on Route One, which ultimately fell to the chainsawsas a part of highway widening. Steve lived life always staying so true to himself, never changing for anybody, yet welcoming and loving everybody. Steve’s old farmhouse operated under the same open-door policy as the rest of his life; if you needed a warm meal, fresh vegetables from the garden, or a place to stay, he always offered up what he had to everyone. Everyone was welcome at his table and no one left hungry, especially Steve, who would always fill his plate at least three times. Later in life, Steve’s actions became focused not so much on causes, but on friends and community. His friends benefited from Steve’s wisdom, humor, and compassion. Those who didn’t know him missed out on his generosity, his warm smile, and his witty, brilliantly told stories, and he could tell a story like no other. He loved storytelling, and everyone got the same version regardless of if they were a small child or a senior citizen. By the time he was finished talking about his latest escapade, everyone would be crying with laughter. He lived for the good times and brought happiness and laughter everywhere he went. Steve is survived by his brother Jeff Burke (wife Judi), sister Betsy LeTourneau (husband Les), daughters Elizabeth (Lisa) Burke and Yvonne (Evie) Laine (husband Bruce), grandchildren Sophia Starrett, Evan Laine, and Olivia Olson, sister-in-law Lois Faria (husband Ray), a large loving family, friends he loved like family, and the apple of his eye girlfriend, Nance Wynne. Steve was a revolutionary. This was not a self-proclaimed title he used, nor an attempt to claim moral high ground. It was his way of living, and loving. A celebration of Steve’s life, by family and friends, will be held at a later date. Arrangements are entrusted to Hall Funeral and Cremation Services, 949 Main Street, Waldoboro, Maine. Provide comfort for the family of Stephen Burke by sending flowers. Steve was a unique person who will leave a big gap in the lives of those who knew him especially me. He was empathic with those around him even when their views were not shared. He was a seeker of justice more than an outlaw. He was always eager to take action some would call bold. He was a good friend. We shared the same heart surgeon although his ailment was a little different than mine. I will miss our 4th of July parade marching and our hikes in the woods & the masquerade balls where Steve dressed as a chili pepper & drove the whole crowd out. He was an exceptionally good man. I have known him for about 20 years. It was a shock to hear that he passed away.